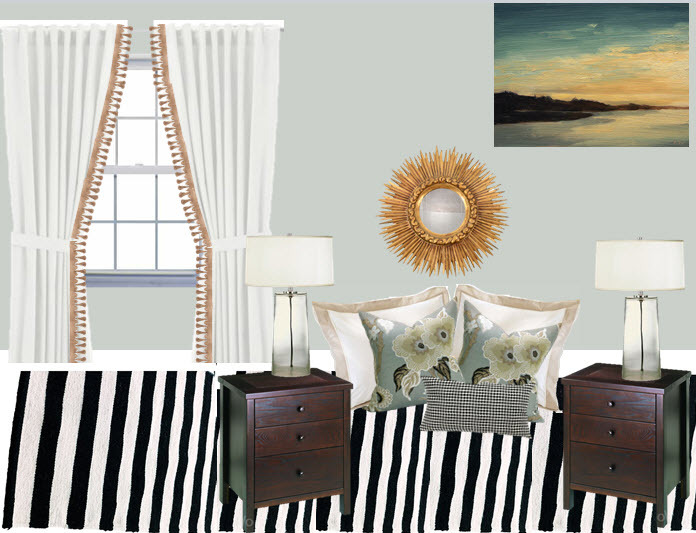 A few weeks ago I was asked by a client / friend to help give her master bedroom a little sprucing. With a limited budget she wanted to keep her current bedroom furniture and basic tan and white bedding but add a few accessories to pull the space together. Painting was not tops on the list, but with the right accessories she could be convinced to repaint the space. A rug was a must because her one year old son plays on the floor while she gets ready in the morning and she wanted to have a comfortable place for him. When I asked how she wanted the room to feel she said, "like I'm on vacation at the beach, but without the light blues, seashells and typical beach chotchkies." In the end I think we might pick and choose from both- but that just makes for an even more personalized space that works for the whole family. Love these, I could totally move into #2 as is. I think the rug is my favorite part. i love this!!!! i love the art in the first one and the feel of BOTH of them! i bet she LOVES these! I'm good with this. That's how I want to feel around my home....like I'm on vacation. Yes! Now how are they going to choose between the 2? Both are fantastic options. Love the idea of vacation trickery at home. Love them both but I think #2 is my favorite. 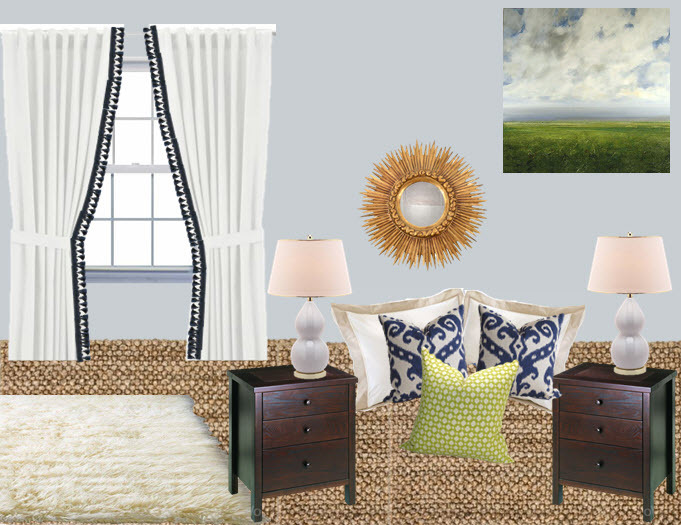 I love the choices, but would choose #2 for the rugs...love seagrass and sheepskin!! Lovely choices! I could do either one, love the art in the first one..Hope you're weekend is great. Great job! I love the second one. It looks so peaceful and the rug is perfect for the space. Both boards are great. Can't wait to see what she chooses! You can't go wrong with those lamps! Gorgeous design. So excited to be your newest follower! Where are the night stands from? I need new ones and those are really cute. Colleen, When I was putting these together I just grabbed an image that matched the color of their existing furniture from google and didnt make a note of where they were from. I'm so sorry!